And PLEASE don’t phone or mail in orders expecting to get this deal; they’ll be normal price that way. Web orders = easy to process, so you save moolah. Phone/mail orders = hard to process, make my head hurt manually calculating discounts, make me grumpy, wife get mad, no peace at Casa Morrow, so no cheapo mags for you. Nerf said. This entry was posted in TNT on 16 June 2008 by Mr. Morrow. 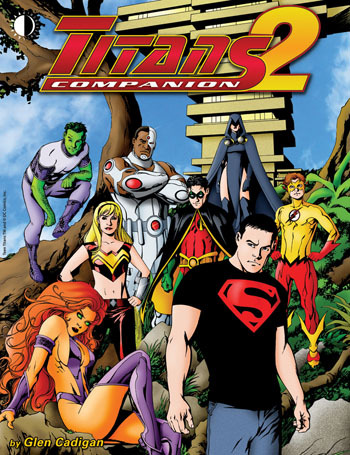 Titans Companion Vol. 2 ships! This entry was posted in TNT on 3 June 2008 by Mr. Morrow. It was only about four weeks late, but last Friday night, we had our Kirby Five-Oh release party at Casa Morrow. In attendance were local Kirby fans Glenn Musial (with wife Jean), Russ Garwood, Ed Stelli, Pat Varker, Modern Masters mogul Eric Nolen-Weathington (with wife Donna and kids Iain and Caper), along with four Morrows (moi included), and BrickJournal editor Joe Meno just for good measure. I played chef, grilling burgers (both real and veggie), hot dogs, and chicken (using wife Pam’s secret marinade), and everybody basically chowed down on a ton of food and had a great time catching up with each other. Glenn, Russ, Ed, and Pat are the stalwarts who, in the early days of TwoMorrows (and up until we moved to our new location about four years ago) would head over whenever a new issue of the Jack Kirby Collector shipped, and help me stuff them into mailing envelopes and sort them for the post office. In return, we’d swill down pizza and shoot the bull about everything from comics and movies to TV, wrestling, and whatever else each of us was into that given month. So this get-together was a nice chance to catch up, since we haven’t all been in the same place at the same time for at least a couple of years (since our last get-together). Why four weeks after the actual release of the issue/book? Cause that’s how long it took us all to arrange a day when we could all be in one place. Glenn just got back from Rome (Italy, not Georgia) the night before, so he was undoubtedly pretty jetlagged, but didn’t let it show. Pat regaled us with more stories of his close friend (and international rock star) Tori Amos, Russ (who manages our local comics shop, Capitol Comics) clued us in on the latest in retailing, and Ed told us about his latest eco-vacation trip. We closed the night with a short video of Jack Kirby’s panel appearance at a 1980s comic con, and vowed it wouldn’t be another 50 issues before we got back together. I can’t thank my wife Pam enough for all the hard work she put into this shindig, from making potato salad to planning what to have on hand for that many people. And thanks to all the guys for the years of helping me get TJKC out to our readers, and the continued friendship.